El Huerto de Lobras is an old house rehabilitated in several apartments that preserve the traditional style and design that had at its best. The Studio is a living room with kitchen and bathroom. 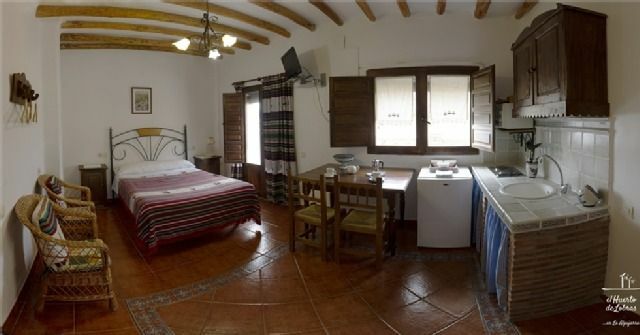 It has a terrace with views of the mountain and the quiet village of Lobras. It has heating, flat TV, refrigerator, microwave, also has all the necessary kitchen utensils. - Services: Typical meals of the Alpujarra are served on request All apartments have outdoor light with views of the countryside, are equipped with, Fireplace, full kitchen, individual terraces, full bathrooms, Television The common area has: - TV room - BBQ - Cellar - Zaguán - A terrace with its garden next to who wants to grow products from the garden - Typical meals of the Alpujarra are prepared, breakfasts, lunches, dinners I hope you like it, because we have tried to make a quality tourism. La ballade des chataîgniers est magnifique et plus encore si vous rencontrez des cavaliers virtuoses sur des pentes extrêmes.